European Renewable Energy Council (EREC) revealed their latest plan to power the European Union with 100% renewable electricity. So this new plan, called "RE-thinking 2050," seems to have been developed from the 2008 report. 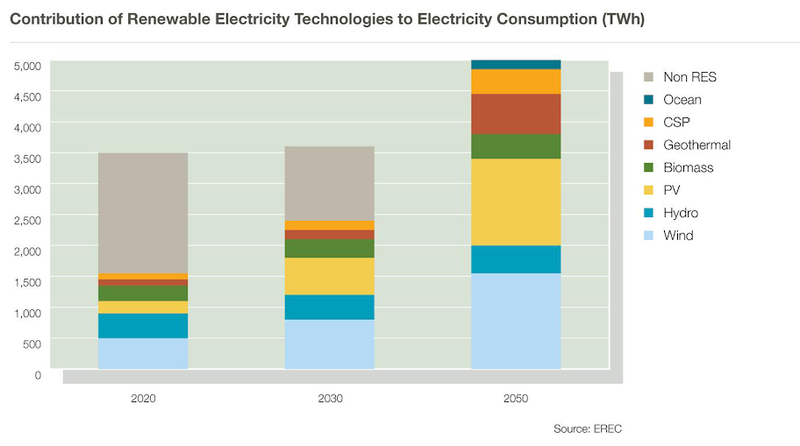 EREC's new vision forecasts that the EU's electricity demand in 2050 will be 5000 TWh. They assess the future installation of renewable power plants will supply 100% of the demand projection. Because renewable energy cannot completely replace fossil fuel in transport sector, the overall energy consumption is not 100% from renewable sources. But they analyzed a significant reduction in total energy demand is possible, thanks to energy efficiency improvement. I am not sure whether their policy recommendations can really assure this plan to be implemented in the real world. I doubt not. I hope so.